ASTANA – Pavlodar Tram Management recently put into operation in Pavlodar the first two of 23 eco-friendly, climate-equipped trams as part of Pavlodar’s ongoing Public Transport Development Strategy. Trams have been an indispensable part of Pavlodar, which was often referred to as the tram capital of Kazakhstan, since 1965. Such an eco-friendly way of transport is particularly important for a heavily industrialised city. Over time, the length of tramways has increased from 11 to 90 kilometres and now approximately 100 trams carry 45,000 passengers on nine routes every day from 5 a.m. till midnight. However, 90 percent of the trams are old and need to be replaced. The new trams meet current ecological, safety and energy consumption standards. “The new trams will satisfy all requirements; they will be equipped with powerful heating systems suitable for our climate and the engines will consume 30-40 percent less energy than those made in 1980s,” said Pavlodar Tram Management Chairman Aituar Zhangazin. The 23 new trams were purchased with a 13-year, $7.68 million loan from the European Bank for Reconstruction and Development (EBRD) and a $2.84 million from the national government. “Trams will be delivered as soon as they are manufactured one by one. 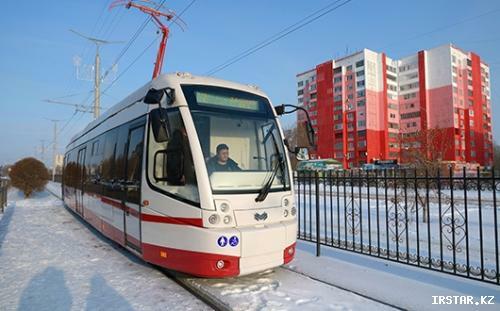 Up to date, three trams have been delivered from Minsk; two were launched last year and one will start working soon. The manufacturer Belkommunmash asks to extend the deadline for delivery, however, still promises to fulfil its commitment,” added Zhangazin. The Public Transport Development Strategy project was also launched by EBRD to improve public transport services. Dornier Consulting International GmbH with the Pavlodar city administration, regional government and other parties established the mission and objectives of the project and conducted a thorough analysis of the system. There are plans to develop a financial model and detailed plan to deliver the strategy.